The paratrike is the easiest and safest way to fly, and you do not need any kind of course or have any specific physical condition, it does not matter if you have a disability, if you are tall or short, just come, sit down and fly. 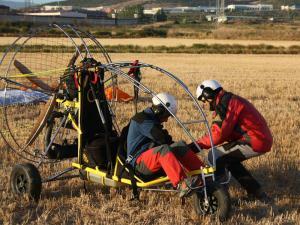 It is a mode that comes from paragliding and paramotor. It is a cart that has been fitted with a powerful engine, a two-person paraglider and allows you to take off and land from a level surface. All advantages, anyone regardless of age or physical condition can enjoy this mode. A bird's eye view with a vision of 180 degrees, with no window or screen that prevents you from enjoying the scenery. Our paratrike is a C2 model built by Airfer. It is fitted with a rotax 500 cc engine which can handle any weight and the late model paraglider has been specifically designed for this type of flying. All the equipment is approved, the trike, the paraglider, the parachute, the intercom helmets, as well as relevant qualifications and liability and accident insurance. The Asociación de Hostelería y Restauración de La Rioja (Association of Hotels and Restaurants in La Rioja) is managed by a group of professionals whose aim is to improve and raise the profile of a profession that represents all that is Riojan: hospitality and good food and drink. The Asociación de Casas Rurales de La Rioja (Association of Holiday Homes in La Rioja) is a not for profit entity bringing together most owners of OFFICIAL, LEGAL HOLIDAY HOMES IN LA RIOJA and providers of rural tourism services. It was set up in 1996 and celebrated its 10TH ANNIVERSARY IN THE RURAL TOURSIM INDUSTRY in 2006, demonstrating great experience and professionalism in this sector. ASCARIOJA currently represents 76 holiday homes in the different municipalities, valleys and mountain ranges in the autonomous region of La Rioja and is always looking to welcome new members. ASCARIOJA is part of Asetur, the Spanish Rural Tourism Association, which includes the largest number of rural tourism entities in Spain and guarantees direct contact with the owners of holiday homes and the relevant associations. We are a group of companies that organise recreational and adventure sport activities in natural environments. All the companies in ATUDER are managed and integrated by professionals who guarantee successful, safe activities for our customers.